We decided to break up our bus journey from Dar es Salaam to Nairobi and spend a night in Arusha. After getting off the bus at the Dar Express bus terminal on Wachaga Street we took a short walk to Makao Mapya Road where we knew there were hotels. Just near the tall Silver Palm Hotel we noticed the brand new Hilton Motel, which looks like a normal house from the street. We paid TZS25,000 for two people in a double room with a double bed, private bathroom, and small but adequate TV with about 30 channels. Everything in the hotel was in good condition and very clean. Shops and restaurants are nearby and central Arusha is 15-20 minutes walk. 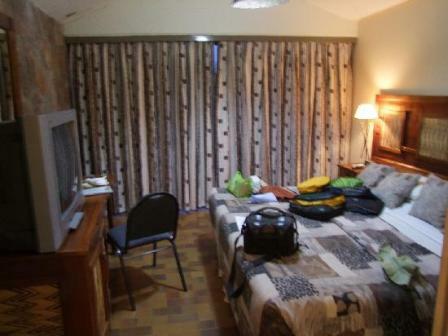 Was very good value for what we paid and ideal for anyone stopping over in Arusha or heading off on a safari. Definitely recommended.